Meet Cheryl Green, a filmmaker focusing on disability identity and culture and making media accessible. voices. Cheryl works to create a platform for people to use the arts to increase connectedness and to promote dialogue and change within the larger community. Hear why Cheryl views Captions and Audio Description as an artistic part of the film/media and a means of achieving disability justice and equity. Her latest film Who Am I To Stop it is a documentary on isolation, art, and transformation after brain injury. She’s a fellow Association of Independence in Radio New Voice Scholar… hit play below and hear how that worked out for yours truly! Welcome back to another episode of Reid My Mind Radio. T.R E I D, Moving podcasts by the GB!
. I’m your host and producer of this podcast. Bringing you stories and profiles of compelling people impacted by all degrees of vision loss and disability. Plus, I occasionally explore my own experience around becoming blind as an adult. I try to present that in my own way blending my words with audio and sound design. I want to send a shout out to those of you who subscribe to the podcast. I truly appreciate you. That simple act of hitting that subscribe button especially if you subscribe via Apple Podcast, increases the chances for others to discover the show. I don’t know why, that’s just what they do!.. One of my main goals of producing this show is to hopefully reach those who are new to the experience of blindness, low vision, vision loss I think the people across the Atlantic refer to it as sight loss. Maybe you are recently experiencing some form of disability. I think there’s something for you here. It’s a shift in attitude that is not based on changing just to change but it’s based on experience. Experience from people who have been where you are right now and worked their way through it. People who accepted what they were given, people who didn’t feel the need to overcome but rather embrace and continue. If you are new to disability let me send you a very warm welcome. A virtual hug going out to you. I’m referring to anyone impacted by disability. Whether you are Blind or Low Vision or maybe you are the spouse, parent or child or even the friend of… we got something for you right chere. And yes, I said right chere! So with all of that said, I hope you are ready because I want to introduce you to a new friend of mine who brings a different perspective to how we view accessible media content. I just hyped myself up and I hope you can feel it too! My name is Cheryl Green. I am an independent documentary producer and audio producer. She’s also a strong advocate and maker of accessible media content including subtitles, captions and audio description. As an independent film maker, we see that’s just one of the unique perspectives she brings to her work. What is your relationship with disability? I like that question. It’s so much nice and more nuanced then what’s your disability and what’s your diagnosis because disability experience is so much more than medical diagnosis. One of my relationships to disability is political. I’m always looking at cultural and political things from a disability rights and disability justice platform. Another relationship is that almost all of my friends and significant people in my life are disabled people. And then because I like things in three’s; my relationship to disability is that I have multiple invisible disabilities, but I’m not sure that invisible makes sense as a term. Non-apparent or easy to hide. Some of them are acquired and some are stuff that I was born with that has shown up later in life from kind of living as a knucklehead and now it’s coming up. Laughs. Oh boy there’s a lot of stories right there. In that one statement, living as a knucklehead. Oh boy! But it’s funny because that’s the one that I was born with. It’s a connective tissue disorder and for me it’s very mild , but I have dislocations and I have chronic pain chronic tendonitis, ligaments that are over stretched. I was born with it. The knucklehead part is that I over did it as an athlete through most of my life. So just chronic injuries and stuff but it’s nothing as fun and exciting as you know…what did she do? Cheryl also experienced a Traumatic Brain Injury that she says is indirectly related to the complications of the connective tissue disorder. Our conversation however, focused on accessible media content. Beginning first with captioning. Now I know most of you listening are way smarter than me but I needed a clarification between sub titles and captions. Subtitles are just a typed out version of what people are saying. It’s just words on the screen as the words are being spoken. Captions also provide descriptions of the sounds music, whether there’s traffic going by, dogs barking. When possible you can add in a description like whispering or tense voice . There’s all sorts of descriptors you can add in there. They should identify who’s speaking and when the speaker switches. The thing about subtitles is that they actually assume that it’s only hearing audiences watching a film that has subtitles because there’s no indication when the speakers change. And if you’re looking at a sunrise and two people are off screen talking and you just see sentence after sentence after sentence there’s actually no way to know who’s talking and when the speaker’s switching. And to me I don’t see how you can follow what’s happening if you don’t know when the different people are talking. Maybe you can’t tell yet, but this subject has a special place in her heart. It’s not just about words on the screen. I love captioning more than anything else that I do. One thing that I love about captioning is that it is so precise, detailed, tedious and repetitive. That just works for me. I look at captioning as part of the art. I do not think of it as a piece of accessibility that you have to add or want to add at the end. To me it’s artistic. Translating things. I can’t literally caption every single sound that is in a piece of art. That doesn’t make sense it’s not even possible. So I have to make creative decisions based on what I think it most important from the creator’s perspective and what I think audiences will want to get from something. I don’t want to be like “Speaks slowly, whispers quietly, birds chirp” I want it to be rich and lush especially when the film or the show is rich and lush. I feel like it’s my duty to make the captions as interesting and beautiful and artistic as the film is. For me captioning is something that I can do in a move towards justice and equity. It is access to information. Whether that’s the news or pure entertainment or something that’s informational or somethings that’s on a social issue. it’s about equity. It’s not just about meeting compliance. I love doing it and I love what it can bring to people and how it can include more people in media and in conversations. Captioning eventually led Cheryl to find an additional way to make media more inclusive and engaging. Through one more piece of access that’s very artistic , very subjective and hopefully integrate it into the art itself. Maybe that’s not the way you’re used to thinking about or even hearing Audio Description discussed. . but that’s what she’s talking about. looking at the captions there not there. There’s all sorts of benefits gained from captioning and Audio description. And not just for the consumer. I think it takes a lot to acknowledge you know what, I made a great film here but I recognize that not everybody can access it because of the way I made it. There’s a big piece of acknowledging this film is not complete until more people can come in. From a capitalistic sense if you have great content and you want an audience why not make your content available to a bigger audience. It just makes sense. But I hate capitalism so I do also value more of a disability justice and social justice and equity lens to say people need to be participating in civic engagement, arts, culture, entertainment and all of it. And What can I do to make that more accessible and available to more people. She’s answering that question from multiple points of view. That’s a Caption & Audio Description provider and as a film maker. I made a comedy film about it and it took off. Okay, maybe that’s not what everyone does. A short film looking at daily struggles of life after traumatic brain injury with dark, honest humor. I sold many copies of it. I’ve taken it to state and national speech therapy conferences. I’ve done Continuing Ed. trainings around it and it was totally impairment based. It was a window into my world. After other films around brain injury, she decided it was time to close that window. I realized I need to get out of the spotlight and get behind the camera and do more. Over the years my films have become much less about impairment and much more about disability experience, marginalization, self-empowerment, autonomy and decision making. I do a lot of cross disability work now. It was all brain injuries in the beginning but that didn’t hold my attention because it can be so impairment focused. Cheryl’s first film didn’t start out with Captions or Audio Description. I didn’t know about access at all when I started, but as soon as I found out I could copy down the spoken words and put them up on the screen; it didn’t look good , but those words were on the screen. And I loved it! She became quite serious about the craft. I read up on the FCC guidelines. I love it when the FCC issues new guidelines new recommendations. I’m there with those white papers reading them to make things the best that I can. Number one, Captions are not just for Deaf people. There’s a lot of different kind of people who want and need Captions. Number two, there were Caption users on the committee that wrote the FCC guidelines. They’re really good guidelines . They make for beautiful Captions They included actual consumers actual Caption users in their creation and that’s another reason I really value them. Laughs… I’m such a nerd! Deep passion for a given subject. That’s what separates the nerds from the rest. In this case, the passion is all about inclusion, social justice and equity. I have a lot of clients a lot of filmmakers who come to me for captioning and they have a lot of complaints about the way captions look. Or they make requests that I find unreasonable. They’re unreasonable because they are centering that hearing filmmaker who doesn’t actually know what Captions are or can’t really articulate what Captions are for. And I say, your aesthetics around Captions are not what I’m working with. I am working to serve Caption users and I have very explicit reasons why I make the choices that I make. I’ll negotiate with you. I’ll talk with you on the phone but you have to understand that Caption users come firsthand I’m not interested in your aesthetic choices around the Captions. If you want access you would make captions the most accessible that I know how to make. I get into fights with people all of the time and it’s so much fun! Don’t worry, know one’s out here recklessly out starting fights. This is all about advocating for the user. IF content creators always included Caption users and Audio Description users in their minds and their target audience then it wouldn’t be a thing. But it’s specifically because people whether it’s willfully or they just have somehow remained oblivious through their careers, they don’t even consider people who would benefit from the access as part of their target audience. That’s why I harp on it . I would love to get to a place where it’s just we have to do color correction, we have to do sound sweetening, we have to trim off 35 seconds on this, we have to add the Audio Description. Boom, boom,boom boomboom! When it’s just part of the practice, yeh, I won’t have to be so political and I won’t enjoy fighting with people. But until we’re at that day for whatever reason I enjoy being super fired up and political about it. The order in which you laid that out where you said ok, they have to do some color correction, do this and let’s add Audio Description. I want that thought about in the writing because to me the end result would be better. I still think that when it comes to things like Audio Description and Captions, there’s a charity model that starts off the process.. Let’s do this because you know (the following said mockingly) it’s a good thing to do for the people. Let’s give this to them so they can be happy. If they thought about it has what you said which is it’s going to make our film better Not just because more people are seeing it but it actually may do something better to the film Meaning, if you think about Audio Description at the time of writing it at the time of producing that film chances are you’re going to think of something that’s going to enhance it. Oh, hundred percent! Oh my gosh, I just got interviewed yesterday they were like what’s the one take home message that you 3want filmmakers to have. I say, you put access in your budget in the pre-production phase. You put it in your budget so there’s no “oh we didn’t know”. And then you always consider it. You don’t just get the supplementary footage or the daily footage. There’s kind of this idea that you find something beautiful you hold the camera on it for at least 10 seconds, get a good shot. You know what? Do it for 40 seconds because then when we’re editing there’s the opportunity to say let’s stretch out this shot a little more because then we can put the Audio Description in. I am totally with you that if you are considering this stuff from the beginning you’re going to film it differently. You’re going to edit it differently. It is going to be better. This is coming from an experienced film maker. Now unfortunately I wasn’t trained in Audio Description back then, and so we didn’t nail that as well. We didn’t have enough stretched out spaces and the Audio Description isn’t as lush as it could be. We did some re-editing and we added in more space. I re-wrote the script, the original Audio Description script, hired other voices to do it. As you watch my film progress over time the same film different versions Audio Description becomes more lush, more engaging more honest because now I understand Audio Description a little better. So there were things that were a little vague in the description. For many such re-writes would feel like a chore. Like her latest production, “Who AM I to Stop it”, a documentary film on isolation, art, and transformation after brain injury, was selected for Superfest International Disability Film Festival. Longmore Institute on Disability at San Francisco State. 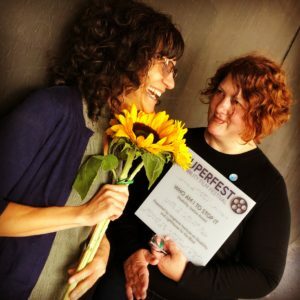 Superfest is one of the few festivals worldwide that is accessible to disabled filmgoers of all kinds. I got an email from the director, hey we love your film it got in, it got an award, but we had to stop during the screening a few times because our Blind jurors felt left out by a joke in the film. It wasn’t described well enough. She said I’m sorry I don’t mean to be negative but are you at all available to re-record. I suppose it’s viewing this process as art that produces Cheryl’s response. Negative, this is the biggest gift in the world are you kidding me let’s go. I rewrote several parts but I specifically rewrote the part that people felt left out by. My Blind Audio description teacher helped point out some spots where she still felt a little bit excluded or maybe even confused about what was happening. It’s just more descriptive. That’s how art should be. As you learn and develop your skills it gets more wonderful. He is a really phenomenal person. He’s a dancer, choreographer and healing artist. He teaches dance. He’s marvelous. He’s Deaf and he’s the Artistic Director I think, of the Real Urban Jazz dance Company. I’ve never done dance before. It was so fun and it was so exciting to try and get the dance moves and match them. And because he’s Deaf he incorporates some sign into the way he dances. I’m not fluent at all, but I’m familiar with Sign language and I’m familiar with the role that facial expression plays in the grammar and expression of Sign language. So I was able to make references to his hand gestures as being Sign and references to his facial expressions. I think I said his facial expressions mirror the expansiveness of his bodies motion. Hopefully, by now, you too should at least start to see the art. It’s the familiarity with the culture that enables Cheryl to recognize such detail. That level of detail and equity goes as far as seeking input from those being described. I sent Antoine the script because it wasn’t going to be in the captions for him to read. He really liked it and he corrected one part that he didn’t like. It didn’t feel fair to him and he gave me words that not only feel more fair to him, but were more beautiful than the words I had chosen. It was so collaborative and so beautiful. When I’m describing what somebody’s body looks like or how it moves I send them my script. I ask them what they think about how I wrote it. or I tell them I’m going to audio describe this please tell me how you want time to describe what you look like. Sometimes people will send me a description that’s actually not very visual. Like when I say how do you want me to describe how you’re moving? And the response is a man with Cerebral Palsy. That doesn’t give me a sense of how you move, but I asked and you answered. And I respect your answer. But it is tricky because the point of audio description is to give people a flavor of the visuals and man with Cerebral Palsy that’s not very visual is it? If it’s your content and I’m describing you and that’s all you give me ok, that’s what I’ll use. When it’s my content I’ll use their words as the starting point and expand to make it more descriptive and more visual oriented. Give me an idea of the types of things that you would include in a description of someone. I try to always describe something that relates to race or ethnicity. If I know how the person identifies then I can use those terms. If I don’t then I might be more descriptive. for instance, I describe myself as a white woman, which is kind of descriptive but not really because my skin tone is darker than any of my white friends. I’m the darkest person I know in my circle of white friends so it’s not super descriptive to say that I’m white. But it wouldn’t be useful to say I’m a brown woman because I’m white. I just have kind of light brown skin. If I don’t know their ethnicity I might say someone with a dark skin tone, someone with a fair skin tone. Sometimes I’ll defer to hair. A woman with bright red hair.. She’s probably white if she has bright red hair. now not necessarily of course. There are different reasons why someone would have red hair regardless of their ethnicity. What would make you choose their hair and what would make you include that in the description. I wonder why would they say that? Why did they now tell me that this person is a Black person or whatever. And I’m like hmm, let me see if this is going to be really necessary to the story line. Sometimes it is and sometimes it isn’t. And it leaves me wondering why they made that choice and why they didn’t describe the white person. Oh my! I cannot tell you how with you I am. I’m going to describe something if it feels relevant to the story or for political reasons. Just end my career now if I ever put something out there where I say the black person and the person meaning white. I don’t know if I would ever recover from my remorse. I don’t do, a wheel chair user and a person. Huh! No! If there’s a wheelchair user and there’s someone else standing. One person sitting in a wheel chair and one person standing. I make political choices If one person’s race or ethnicity or nationality becomes relevant to the story, I am going to make a point to name everybody’s so that I’m not singling one person out as the other or the weirdo or the outsider. No, I will name them all or I will name nobody. And it really depends on the content creator, what they’re going for, how much time there is and yes is it relevant. Is it going to make a difference to the story for me to know something about the ethnicities of the people involved and is there time to get that in there. And if I can’t describe them all then I can’t describe any. or sometimes I will tell somebody, you need to stretch out that first scene because I have got to get that description in there. I have to! Movies, television are often a reflection of society. It’s not surprising that the politics of the world impacts the way we think about and create access to content. There are many who believe the best approach is to ignore race or ethnicity all together. As Cheryl points out, the results don’t lead to equality. I think when Audio Describers are shy, oh I don’t’ want to say those words, as an Audio Describer your comfort and discomfort are not supposed to be part of this. You’re censoring it for the viewers. You know I was really moved by your episodes around Black panther. There’s the access piece, but also one of the ways we white wash is to pretend like white people are neutral and just people. And so whatever we think is important is what’s important. And yeh, they had some cool costumes in Black panther, but ok, cool costumes whatever. That’s not fair. It’s so beyond not fair, it really is a show of white supremacy. To neutralize overt displays of culture that are not white, you erase them, you ignore them. That is white supremacy. And it’s not ok. If the film maker did not erase culture then the Audio Describer or Captioner really should not erase culture as well. Cheryl says the same occurs in captions. Not only is she creating films, accessible content through subtitles, captions and audio description, Cheryl produces the podcast Pigeonhole. out of the narrow pigeonholes people attempt to stuff us in. She’s a fellow recipient of the New Voice Scholarship warded by Association of Independence in Radio. Receiving that scholarship puts us both in a very exclusive group of some of the best audio makers currently making radio and podcasts. Audio: Microphone and other equipment collapsing during my conversation with Cheryl. Well, maybe not all of us! You can find Cheryl online at WhoAmIToStopIt.com She tweets under that same name, which again is her latest production. Her films are available through New Day Film.com. Checkout Cheryl’s podcast Pigeonhole – that’s P I G E O N H O L E. I especially like the episode titled “A nap and a bird.” It’s a short well told story that says a lot. We’re continuing to advance our ongoing conversation around Audio Description and content access in general. Considering captions & AD as art? Why shouldn’t it be. It’s the written word that has some pretty strict requirements including the time constraints and a need to quickly convey a message. We’re talking about talented writers and voice actors/narrators. Let’s spread this way of thinking about accessible content. Let’s push for content creators like Cheryl whether independent or in the major studios to see it as a tool to improve their storytelling. Then maybe we’ll see it become a part of the pre-production and be more of a reflection of the film’s conceived vision. Looking at content access through a social justice lens feels like it leads closer to inclusion. A big shout out to Cheryl Green! I enjoy speaking with her and appreciate her perspective. I guess I’ll go ahead and put this right here… I hope you will hear more from her right here on the podcast in the future. You know, I still hope to hear more from you the listener. I’m not looking for you to write me long messages about how much you love the show or how funny you think I am or how much you like the production, or how much you think this podcast should be the top podcast on the charts or how it makes your day when a new episode publishes… no who would want to hear any of that! I just want to know if it made you smile, gave you an idea or maybe encouraged you to do something. I send myself fake messages about all the other stuff so I have that covered! So make sure you Subscribe! Audio: Bring the audio to a screech! if you mainly listen to the podcast via Sound Cloud I’m hoping you will continue to listen but I am moving away from that platform. I’ve been tolerating their interface in order to avoid the move to another service. I may decide to keep one or two episodes available, but the best method for staying caught up is to subscribe via Apple Podcast, Spotify, Google Podcast, Stitcher, Tune In Radio and wherever you get podcasts. I appreciate you listening and if you liked what you heard please rate and even review the show via Apple Podcast. And please, tell a friend to listen. Spread the love, man!